The stunning Sarno range offers the ultimate in Rattan furniture, with its mixture of Rattan weaves and a choice of solid or scatter back. Sprung seat. Frame colours available in Natural Wash and Pecan Brown. 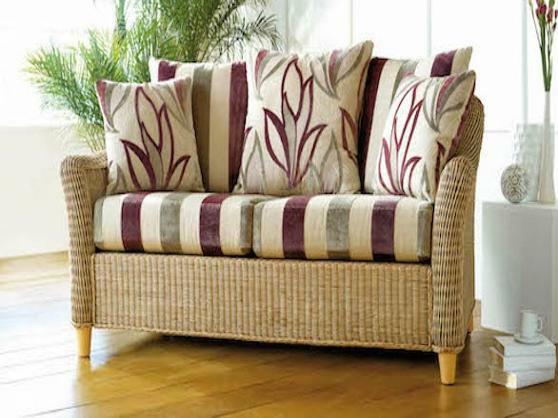 Shown with Roselli Stripe and Roselli Floral fabrics. Cane Industries operates a 4 tier fabric system. Level 1 is the cheapest fabric and is usually 100% cotton. Level 2 and 3 are more expensive fabrics and are more hardwearing. Level 4 fabrics are mainly stripes and are the most expensive. All of the fabrics are removable and can be dry cleaned. Cane Industries offers a 2 year structural guarantee on all of its frames. For more information click HERE.